, giving you a define path to walk on and a way to but your stamp on your garden. Whether you are commemorating an occasion with handprints or just want to add a little color to your garden, these custom stepping stones are a great addition to any garden. 1. Set out all of the molds for the stones you want to create. 2. Mix the Quikrete using the directions on the bag. The resulting mixture should resemble oatmeal. 3. Spoon the mixture into each plastic planter saucer and smooth it down to make it nice and compact. 4. Leave each stone to set for 45 minute and then begin decorating as you please with hands prints, decorations, or anything else you want to set in the stone. 5. 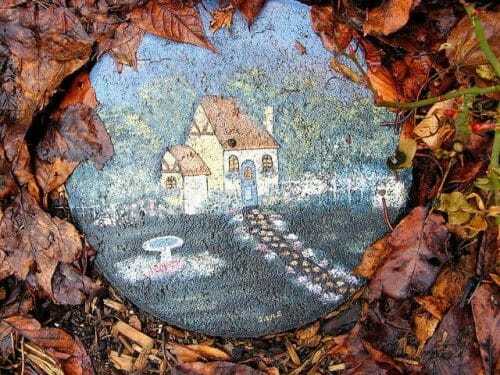 Allow the stepping stones to set for up to a week before you put them outside for use. It is important to note that cement can be toxic, so make sure htat you are properly protected before undertaking any projects. Gloves are a must and eye-protection is highly recommended.